But thereafter there is no response to any text entered. I have this on Windows 10 and using a Rasberry Pi. This behaviour suggestst that the serial connection and driver are correct (?) but that something wrong with data exchange. I am using Putty on Windows, and minicom on R Pi. CRLF is enabled. BUT, if I use a serial console on an Android phone using OTG, get the correct response. This is set to CDC driver. This confirms that the board, cable etc are OK.
Any suggestions what is needed to get either Windows 10 or Raspberry Pi to respond to the serial port? 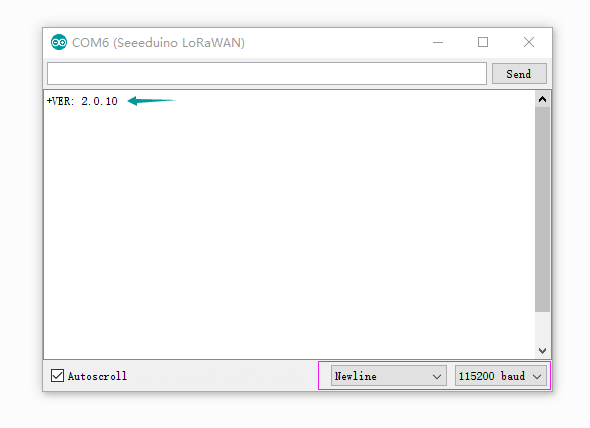 Hi, if you want to enter AT command mode, you have to download below code to seeeduino lorawan first. then open the com monitor and config as below. We enter AT+VER, we will see below info.